A guy gets bitten by a radioactive spider, and suddenly he can stick to walls and ceilings, spin webs out of his hands, sense impending danger, and react with super-human speed and strength. Further evidence that all these people who get turned into super-heroes by life-changing (or life-threatening) events were already super-heroes. I mean, that bite would just have killed most of us, right? New York City--at the mercy of the GREEN GOBLIN! He's booby-trapped the city's skyscrapers with SUPER BOMBS! I must save the city NOW. But the GOBLIN will try to stop my every move. Criminals and time bombs--even the GREEN GOBLIN himself--stand between me and the SUPER BOMBS! Can I save the city in time? 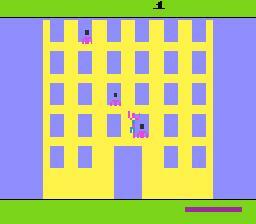 --From the Atari 2600 Spider-Man instruction manual. 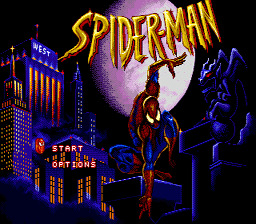 I wish I could tell you that this is one for all gamers... however, unless you're a die-hard Spider-Man follower, you may want to take this game and smash it before beating it. The graphics are decent enough, for 2600 standards, and Spidey does have his traditional red and blue garb, but the web is... black? Ehh, moving along, the sounds are to the 2600 level as well, so I don't think we need to go into grave detail about that. Gameplay is a hit and miss in some respects. When it comes to shooting the web, you need to be careful so that the web reaches any yellow part of the building, and the frustrating control is not quite on your side. While this one is actually strangely addictive, I'm sure the mesmerizing effect may wear off soon enough. *You Must Download And Install The Client Before Playing. Peter Parker was watching the television one afternoon when he heard some shocking news. The notorius Kingpin has planted a bomb in New York City and is placing the blame on Spider-Man. Identifying himself only as a concerned citizen, the Kingpin has set all of New York City in a panic! It's up to you as Peter Parker to put on the Spidey suit and clear your name. You must be careful where you go -- the Kingpin has also put a $10,000 price on your head. All of New York -- even the police -- is out to get you! Your first stop should be the Daily Bugle to check and see if the public is buying the Kingpin's story. If they are, it's going to be up to you to provide the pictures to clear your name. Besides that, you're got to do something about the bomb the Kingpin planted. He's got six evil henchmen working with him and you'll have to battle each of them if you want to get to the Kingpin himself. Each henchman has a key to the Kingpin's bomb. Everytime you defeat a henchman you'll get a key. You'd better hurry, because if you don't have all six keys in twenty-four hours the bomb will destroy New York City! Along the way, make sure to take pictures of the action, just as Peter Parker would. Once you've defeated a villain you can sell the pictures to the Daily Bugle for cash you can use to buy material to make more webbing. After all, you're bound to run short of webbing before this day is through. If Spider-Man can live through this day and clear his reputation, Peter Parker should get some well-deserved rest. Now hurry, you've only got twenty-four hours to finish your mission! --From the Sega Master System Spider-Man instruction manual. Peter Parker was watching the television one afternoon when he heard some shocking news. 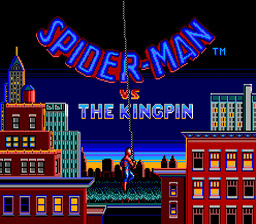 The notorious Kingpin has planted a bomb in New York City and is placing the blame on Spider-Man. Identifying himself only as a concerned citizen, the Kingpin has set all of New York City in a panic! It's up to you as Peter Parker to put on the Spidey suit and clear your name. You must be careful where you go -- the Kingpin has also put a $10,000 price on your head. All of New York -- even the police -- is out to get you! Your first stop should be the Daily Bugle to check and see if the public is buying the Kingpin's story. If they are, it's going to be up to you to provide the pictures to clear your name. Besides that, you've got to do something about the bomb the Kingpin planted. He's got six evil henchmen working with him and you'll have to battle each of them if you want to get to the Kingpin himself. Each henchman has a key to the Kingpin's bomb. Every time you defeat a henchman you'll get a key. You'd better hurry, because if you don't have all six keys in twenty-four hours the bomb will destroy New York City! Lemme just say, this game will appeal to both Spidey and adventure gamers alike. 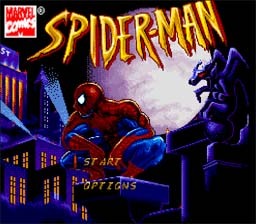 The graphics are done nicely, Spider-Man and the enemies a good size. The sounds and music are okay, nothing to brag about. The game-play is nice as well, battling a boss at the end of each stage. If you're a little skeptical about this one, play for yourself, and rate it on your own likings. A 14 issue mini-series. A great super-hero. An awesome anti-hero. 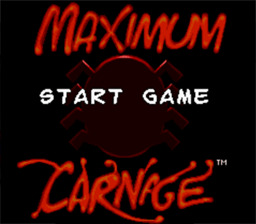 Combine all that together and you get Maximum Carnage. Cletus Cassidy is a psychotic killer being held in a mental asylum. On one nasty night a red symbiont (Venom's son) fuses with Cassidy to create Carnage. 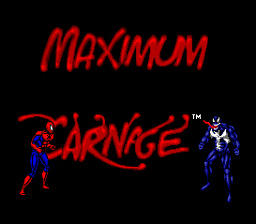 Carnage, along with Doppleganger and Demigoblin (just to name a few) are terrorizing New York City. Who out there can stop them? Only Spider-man, of course. Well, with the help of Venom and a few others, they can save his beloved city from destruction. 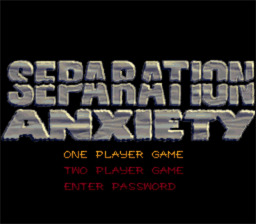 Well, this is a pretty straightforward beat em up. It reminds me of Streets of Rage. The graphics are good (nothing special), but they let you know who is who. Spiderman and Venom(Eddie Brock) have to team up against the children of the symbiote, before they can take over the world. Are you a bad enough dude to wear red tights? 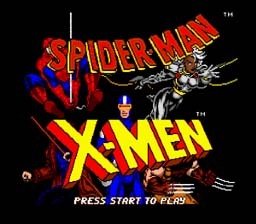 Spiderman and the X-men unite in battle against techno-villain Arcade's legions of robotic rogues. No pun intended, she's not in this one. The sprites are really well drawn and the animation is smooth. The music is at least good enough not to drive you nuts, and the sound effects are very good. 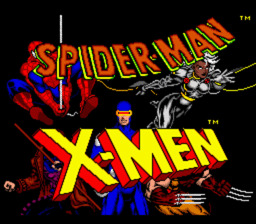 Awesome graphics and sound back up great game-play and story to make one terrific game.